Blake said “Emily hit a big note before Cierra that I thought was the power moment in the song. 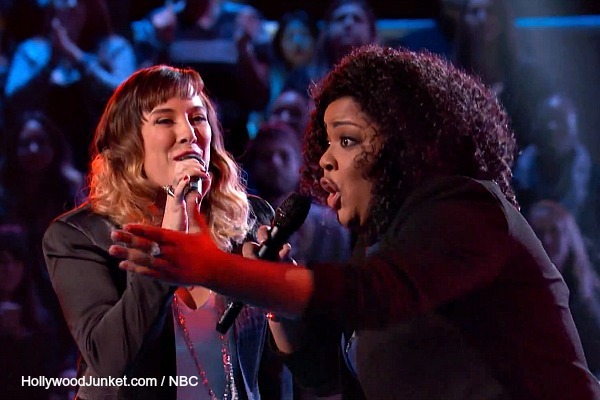 For that reason, I’d pick Emily.” From THE VOICE season 6 episode 10 PLUS Photos, Coach’s Comments & More. “Great music -it doesn’t matter what it’s wearing and it doesn’t matter where it’s from” Adam said. His adviser Aloe Blacc said that is why “The Voice” is so great. The first battle pairing of the night came from Team Adam. Cary Laine said when moved to Wyoming, she has fewer gigs. Twenty-five year old Sam came to”The Voice” to prove to her parent that her future is in music. Adam gave them the song “Give Me Love” by Ed Sheeran to sing because “where they come from and what they’re used to doesn’t apply and that’s a good exercise,” Adam said. Cary said because Sam’s voice is original, it’s intimidating. Sam said Cary can hit the big notes and that’s something that she has to watch for. Adam told Cary she is getting pitchy. Aloe Blacc told Cary he’s getting a great voice from her, but not a great feeling from her. Cary considers this song to be a stretch for her. After the battle, Blake said, “You guys captured the mood of that song. He told Sam, “when you bounce back and forth from Your falsetto and to your regular voice, you get pitcy.” He said Cary was also a little pitchy and they are so different that he doesn’t know what Adam is going to do because no one won that battle. Coach Adam was indecisive on who won the battle because it was so close. He said, “you take take away the cowboy boots on Cary and Sam you take away the leftist, you hear that the voices are very similar. He said they were both out of their comfort zones. Adam told the other coaches “Thanks for giving me no help.” He decided on which of the moments that were the most special that he could expand upon. So, he chose Sam. Kaleigh’s father is a classical music artist. She had all four coaches to push their buttons. Noah was inspired by his late grandfather to come to “The Voice”. Team Blake’s advisers are “The Band Perry”. The song that Blake gave them was, “Everything” by Michael Bublé. Because Noah’s style of singing is a similar style to Buble, Blake said this song is “in Noah’s “wheelhouse.” Kaleigh is “faux rock” and Adam is a crooner which is why Blake thought it would be a good song for them. Every now and then Kaleigh will hit a note that will “demand your attention” Blake said. During their second rehearsal, Blake said that Noah was not singing the same song and going way over the top. Host Carson Daly told them after their battle, “That was the nicest battle I’ve ever seen.” Usher told Noah, “your performance was a bit lounge. Michael Buble can sometimes give you that but has a finesse to it and a sexiness to him but in a most masculine way. Eventually you pulled it around and showed a great upper range.” As for Kealeigh, he said, “you have a very unique tone and I’d like to hear more of it.” He said Noah won the battle round. Adam said, “You guys are great singers. I turned around for both of you.” He said the chips were against Kaleigh because the song fit Noah more. But said he thought Kaleigh won the round. Cierra traveled from Alaska to audition for “The Voice”. She said there is no where in Alaska to pursue music. Emily had a rare syndrome where she had to go through brain surgery. Team Shakira adviser is Miranda Lambert. You have soulful voices and a wide range Shakira said is why she put them together. Shakira gave them the song “Brave” by Sara Bareilles to sing. “I am experiencing what it means to be brave” Emily said because she went through brain surgery. “This is where your artistic side will show the most because you have to make the song your own” Lambert told them. Shakira told Cierra to be more exact with the notes, and told Emily that it sounded more like she was screaming than singing. Lambert commented that even though they are friends, during the battle they must decide if they are staying on “The Voice” or going home. Coach Shakira said, “Cierra I’m a sucker for thick voices like yours,” and said she admires Emily’s determination. “The mistakes that you both had were the same mistakes. So, it’s difficult to pick a winner.” She chose Emily as the winner of the battle. Next week a second round of battles will be introduced. The best, of the best will re-enter the ring to compete. Who they will battle will be surprise and they will have to agree on their song that they sing. Each coach will have one final steal. Watch THE VOICE season 6 episode 12 “The Battles Continue, Part 4” first aired by NBC on Tuesday, March 25, 2014. This full episode is now available at HOLLYWOOD JUNKET until 06/19/14 courtesy of NBC. ENJOY!